crafty caroline: Sheena is back!!!!!!! Hello. Yes I am blogging. I am so sorry to have not blogged in the last few months, but I've been a bit poorly and had to have spinal surgery. But, I'm back and rearing to go. Welł, what a restart to blogging this is. Sheena Douglass is back on Create and Craft with a weekender, and it's this weekend. She will be on the telly on Saturday at 9, 12 and 6, then Sunday at 11, 2 and 7. Do not miss these as there are some amazing new stamps and dies. The range is Vintage florals. 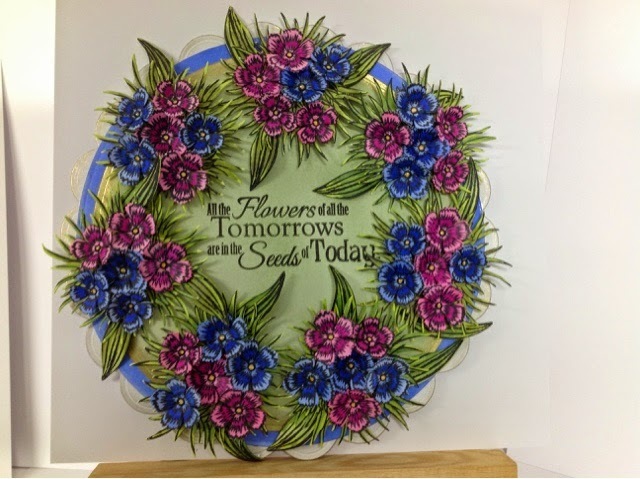 There are 6 sets of dies and stamps in this new collection which are Poppy, Sweèt William, Lilly, Bluebell, Anenome and Pansy. They are amazing, I cannot wait for you to see all the Inkoids samples and what Sheena is going to demo. Please look at all the Inkoids blogs, and on Facebook to see their samples. Also, if you are on Facebook there is a new page which is run by all of us Inkoids, which is basically a fab group where you can share all your crafty makes as long as it contains Sheenas stamps, folders, stencils and dies. Please pop onto Facebook and request to join if you want a crafty get together. Phewwww, well I had better share a couple of samples with you. As you can see I have used Sweet William and Pansy. Sweet William is coloured with spectrum noirs alcohol pens. I love this one!!. The pansy is heat embossed onto parchment paper, and then coloured with Spectrum noir pencils. I hope you like them, and will be back tomorrow with a couple more samples, and at least that post will not be as long as this one. Thanks for stopping by and catching up. Sorry to hear you have been poorly Caroline, I hope you are recovering well from your surgery. 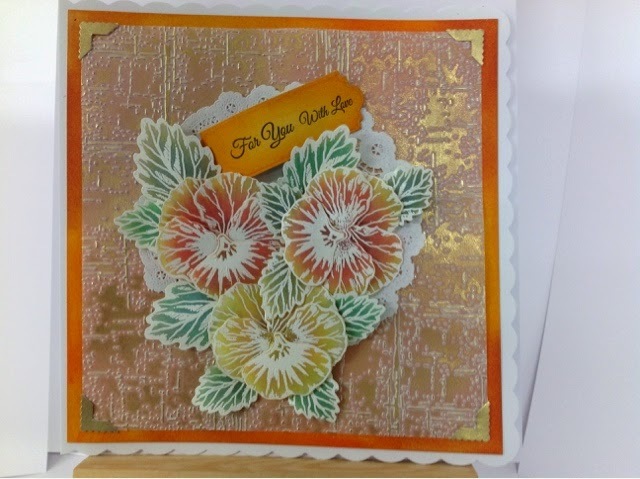 Two gorgeous cards and loving the designs.